As the incoming Executive Director of the Nobel Peace Prize Forum, I am incredibly excited about the Norwegian Nobel Committee’s decision today. In their announcement, the committee made the critical point that upholding the rights of children and young people must be respected – and that the violation of children leads to violence from generation to generation – especially in conflict affected situations. Today’s decision is a beacon, and symbol of courage – peace takes courage. It takes perseverance to work for peace, stand up against oppression and use one’s voice, no matter what age you are, in support of peace and human rights. This can be a perilous and winding road. 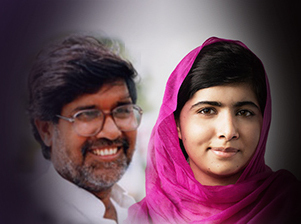 Kailash Satyarthi’s journey to protect children from exploitation for financial gain has been a brave one, underscoring the responsibility of companies to uphold and implement business practices that support peace and human rights. There is no doubt that violence committed against children and young people can sow seeds of hatred and revenge that may last lifetimes – but Malala Yousafzay shows us how to turn a seed of hate into a seed of peace. It is this kind of strength and courage we celebrate today.